When several people in southeastern Guinea were hurt in road accidents during recent election campaigning, a regional public hospital treating eight of the injured ran out of emergency medical supplies. “The hospital used up all the bandages, suture kits and other supplies on hand to treat the accident victims,” said a health worker in the regional capital N’zérékoré who preferred anonymity. With all eyes on the presidential election, set for 27 June, health officials and aid workers hope political change will lead to improvements in a broken health system and other social services. A more stable political situation is also expected to pull back much-needed donor assistance. “Shortage of medicines in public health centres is one of our most serious problems,” said Mohamed Lamine Tounkara, regional health director in the Kindia region, 137km east of the capital Conakry. But he said he is hopeful that a successful election will help turn things around. After junta leader Moussa Dadis Camara’s exit following an assassination attempt in December, the interim military government has moved swiftly to organize elections in which no soldiers are standing. “If the political situation improves there is a good chance development partners will have more confidence to invest and help build up our infrastructure and capacity,” Tounkara said, adding that a new Health Ministry initiative would reinforce primary health care, and that with the right support the programme could go a long way to improving health services. Lack of medicines in health centres is just one of the most tangible examples of how deficiencies in basic services affect the population. Guinea, for years hovering between stability and all-out crisis, has long been caught in a donor funding gap, UN officials say. Donors are not inclined to fund the “chronic crisis” as some have called Guineans' dire living conditions, and yet threats of a full-fledged disaster that would trigger greater humanitarian aid have not materialized, said Philippe Verstraeten, head of the UN Office for the Coordination of Humanitarian Affairs (OCHA) in Guinea. 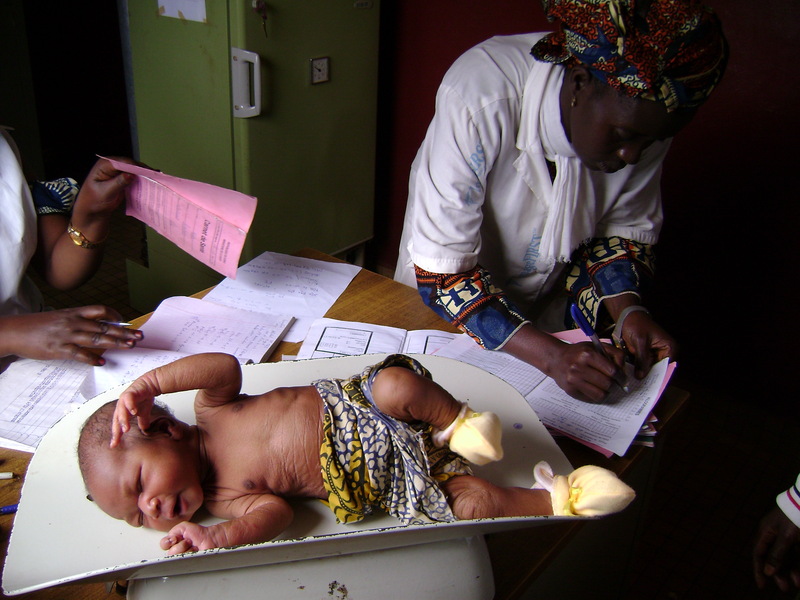 Baby-weighing at a health clinic in Labe, Guinea. October 2007. Most major donors suspended aid to Guinea after the December 2008 coup d’état or the September 2009 violent crackdown on civilians by soldiers. A deterioration of social services dates back years, with a sharp dive since a political crisis starting in 2006, aid workers in Guinea say. Childhood killers such as measles, tetanus and polio - all preventable - have returned because routine immunization coverage has regressed in the past few years, Harneis said. The UN and NGOs have stepped in to avert emergencies but these are “stop-gap measures” and do not achieve necessary fundamental reforms, he added. But it is not only a lack of external support that poses an obstacle to reform, observers say: corruption and poor management in the public sector are major factors. Improving public sector management and basic social services are among the things many of the 24 candidates have given as top priorities. One of the top contenders calls for universal access to health care and improved medical services "to relieve the people of a poor health system and the burden of disease". Another manifesto says: "The misery of some of our citizens constitutes a violation of human dignity" and says better management of the public sector is indispensable for development. In the immediate term government humanitarian officials, UN aid agencies and NGOs are focused largely on preparing for the rainy season - some areas of Conakry have already seen flooding - and on contingency plans for potential election-related strife.